This piece, though autobiographical, contains ‘archival’ documentation of my earliest experience in creation of corporate identity. 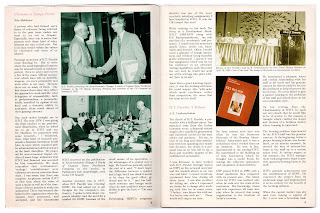 The documentation may be useful for students of design interested in history, especially since it is not available in the public domain, as yet. It was sometime in 1976. HT Parekh had retired as the chairman of ICICI in 1976. (Today’s generation may not even know that ICICI was, at that stage, a development bank; the acronym stood for the Industrial Credit and Investment Corporation of India.) After retirement, he wanted to pursue his dream to set up a company that would provide housing finance to individuals. No institutional loans for housing were available then in India; and all lending was capital-geared, not income-geared. It was a path-breaking effort. He had chosen a small team from ICICI who would assist him in all the preliminary steps for incorporating this new company. My responsibilities were related to what was loosely known then as ‘corporate communications’ which involved anything from writing & research to supervising the printing and stationery design! 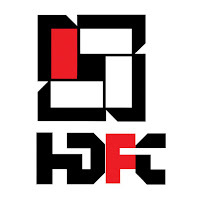 Once the company was registered and the name clearance received for Housing Development Finance Corporation of India (HDFC), the first among my tasks was designing the letterhead and stationery. At that stage, ‘branding’ and ‘corporate identity’ had not yet become the buzzwords that they are now. There was barely any ‘design thinking’ on this aspect among corporate chieftains of those times. So when I asked HTP (as Mr Parekh was generally referred to), whether he wanted me to develop a symbol or a logo for the company, he looked at me quizzically and said: “I don’t know the difference. Do what you think is necessary.” And with his Buddha-like smile, he uttered his signature words: “Do your worst! Come back to me only with the final product, if you are personally satisfied with it.” That was the kind of freedom he gave to those of us whose professional judgement he trusted. There were two outstanding designers in Bombay whose names I had heard frequently in advertising circles then: Yeshwant Chaudhary and Sudarshan Dheer. I just so happened that I could contact Mr Chaudhary first, as Mr Dheer was out of town on that particular day. 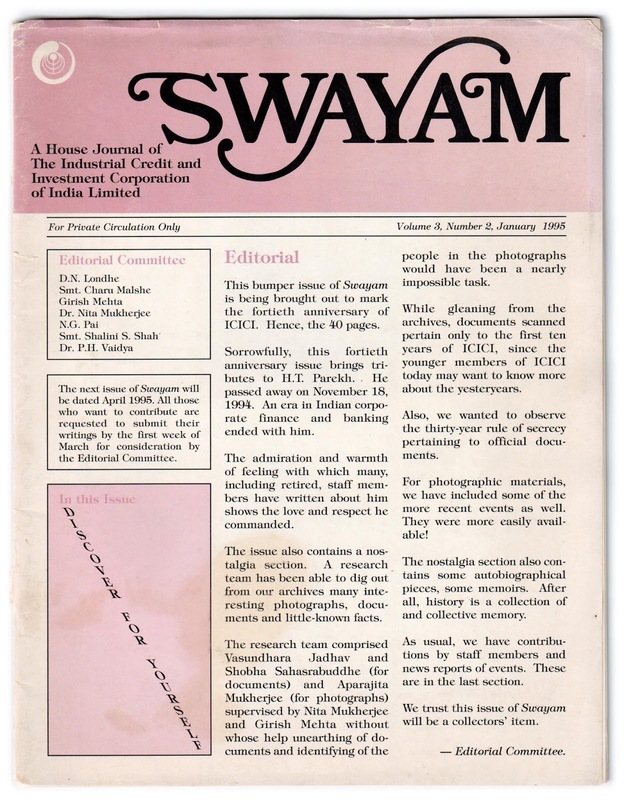 Yeshwant Chaudhary, a brilliant alumnus of the Sir JJ Institute of Applied Arts (Bombay), who had done his post-graduate studies from the Central School of Art and Design (London) and worked for CIBA (International, Switzerland), had returned to India and set up his own firm Communica Corporate Communications. Our preliminary meeting went off so well that I decided to work with him on the assignment. 1) Since the company was looking at retail finance, he should work on a symbol. In India, a country of many languages, a logotype of HDFC, an abbreviation of the name in English, would convey little. 2) The symbol should be so powerful that it should establish the product, namely, housing finance, which itself was new for India. 1) HDFC would strengthen the financial infrastructure of the country by catering for a ‘felt need’ of a large, emergent middle class. 2) Steeped as he was in the philosophy of development finance, HTP said his organisation would always be ‘development-oriented’. 3) The organisation would always be customer-focused and based on ethical practices, especially since the real estate sector in India was mired in practices that were to the contrary. 4) The business of the organisation was predicated on the belief that the average Indian borrower takes repayment liability seriously, if the credit-provider was not ‘extractive’ and understood the borrower’s capacity to repay. 5) HDFC would encourage developments in housing technology and skills. 6) Since HDFC would channel the savings and investments of the ordinary public, it would keep these stakeholders’ interest in mind. 7) It would be a publicly-owned, professionally managed company, along the lines of ICICI that HTP had nurtured for 20 long years at its helm and prevented it from near extinction. The combination of symbol and logotype that Mr Chaudhary developed is now a part of the annals of visual communications. His treatment of four panels that constituted the symbol was as bricks. According to him, these stood for ‘Housing, Environmental Development, Finance and Recycling of Resources’. One panel was in red, as he wanted it to stand out; it indicated Finance and was abbreviated as F in the acronym – that was also in red. We deliberately chose to use the logo in lower case rather than capital letters for several reasons. One, HTP’s approach was always diminutive. He was not an aggressive, chest-thumping banker and chose to let performance speak for itself. Two, the organisation was introducing a new concept; it was taking small baby steps. Three, lower case letters lent themselves better in execution of a composite of the symbol and logo. Mr Chaudhary’s design had the symbol and the logotype as one unit; the symbol above and the logotype below. When Mr Chaudhary and I went to make the presentation to HTP, we entered his room with trepidation. I was nervous because it was my first assignment – to create a visual corporate identity for an organisation. And, perhaps, Mr Chaudhary was anxious because he would be meeting the legendary HTP in person for the first time and also because he had based his entire execution of the identity on the basis of his interaction only with me! For safety’s sake, Mr Chaudhary had carried some of the alternatives to the combination of the symbol and the logotype. But he need not have done that. After ordering coffee for us, HTP asked for the design, had one look – I could see that he liked what he saw. And then, he asked me: “Are you happy with this?” On hearing an answer in the affirmative, he said: “OK; leave only this folder with me; I will show it to the rest of my team. How soon can you get the stationery printed?” Mr Chaudhary was incredulous. He could not believe the speed of decision-making! But that was HTP. And, as they say, the rest is history. 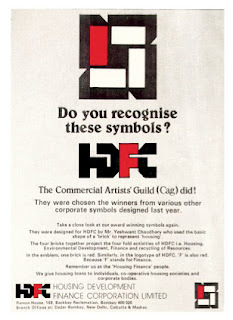 HDFC’s corporate identity won the CAG (Commercial Artists’ Guild) Award in that year. Today, this organisation is called Communication Arts Guild. The name change occurred somewhere in the 1980s; among the people behind the name change were Mr Dheer and Mr Chaudhary who argued that ‘commercial artists’ almost had a pejorative connotation! At one time, CAG Awards were the most coveted recognition of professional talent in Indian advertising industry. Now, the organisation has nearly faded into oblivion. Image courtesy HDFC corporate communications department. 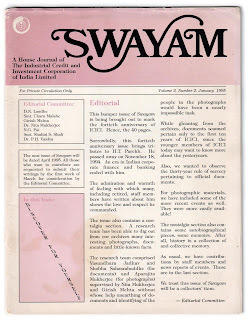 I had mentioned this experience in a commemorative issue of ICICI’s internal newsletter Swayam. It is a tribute to Yeshwant Chaudhary’s work that, in the 40 years since, HDFC has made only marginal changes in his design – they use HDFC now in capital letters! The first change was made in 1984 and the second and third in quick succession, in 1994 and 1998. These images are reproduced below.